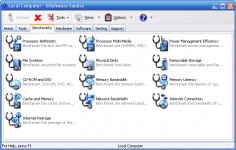 Sandra offers many detailed information about the computer, being a handy diagnosis, monitoring and reporting tool. 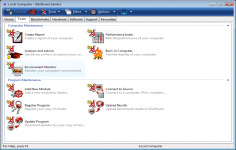 Sandra Lite (System ANalyser, Diagnostic and Reporting Assistant) is a handy utility for computer evaluation and diagnosis. The software is divided into three parts - Computer Maintenance , Module Types and Maintenance Program. Computer Maintenance and Module Types are used to manage the computer, evaluate the performance (benchmark), provide hardware information, software and technical support. Sandra can evaluate the performance of the processor (multimedia, multi-core, energy efficiency, cryptography) , graphics card (video rendering, video memory, GPGPU) and also devices storage and the RAM. Regarding the monitoring, Sandra displays information such as CPU temperature, GPU, chipset , speed PCI Express bus , RAM and more. Sandra has also a very interesting feature that allows to know the price of computer components . Curently we don't have any log information about Sandra Lite version 2018 (28.61). We will this change log update soon!